I want to be an astrophysicist too! How do I do that? If the Universe is expanding, what's it expanding into? Is dark matter really just a fudge factor that will turn out to be a modern-day aether? Are dark matter and dark energy related? Will you present at my event / speak on my radio show / appear on my podcast or online video / write for my publication? I have a theory about the Universe. Will you read it? Will you answer my questions for a project I've been assigned in school? I only want to hear about science. Why do you talk about sexism/racism/bias etc? See this page for Twitter-specific FAQ. Great to hear! Check out this page: "Advice for Aspiring Astrophysicists" (and, if you'd like a shorter thread, this Storify). Basically you should learn a lot of math and physics and programming and communication skills, and, if at all possible, try to get involved in some kind of research. See the page for more tips. Good luck! Well, probably it isn't expanding into anything. The Universe might not have any borders at all. It might be infinite, or it might loop around on itself... we can't say with current data. What we can say is that the density of the Universe is going down with time, in the sense that the distances between distant things (galaxies, for instance) is getting larger. But that doesn't mean there's an edge beyond which there's some other kind of space. The Universe might be infinite and getting more infinite! Here's an analogy. The Universe is expanding the way your mind is expanding. It's not expanding into anything; you're just getting less dense. Slate article: "The Dark Matter Poltergeist"
Here is a presentation I gave at a conference that lists some of the ways we know dark matter exists. As far as we've been able to tell, there doesn't seem to be a connection between dark matter and dark energy, though some theories suggest that they could both be related to the evolution of some third unknown component of the Universe. Given that we don't have any solid evidence for this, though, I'm inclined to think they're completely separate, given that they act totally differently. Dark matter is (as the name suggests) a kind of matter, which means it has gravitational attraction and forms clumps. 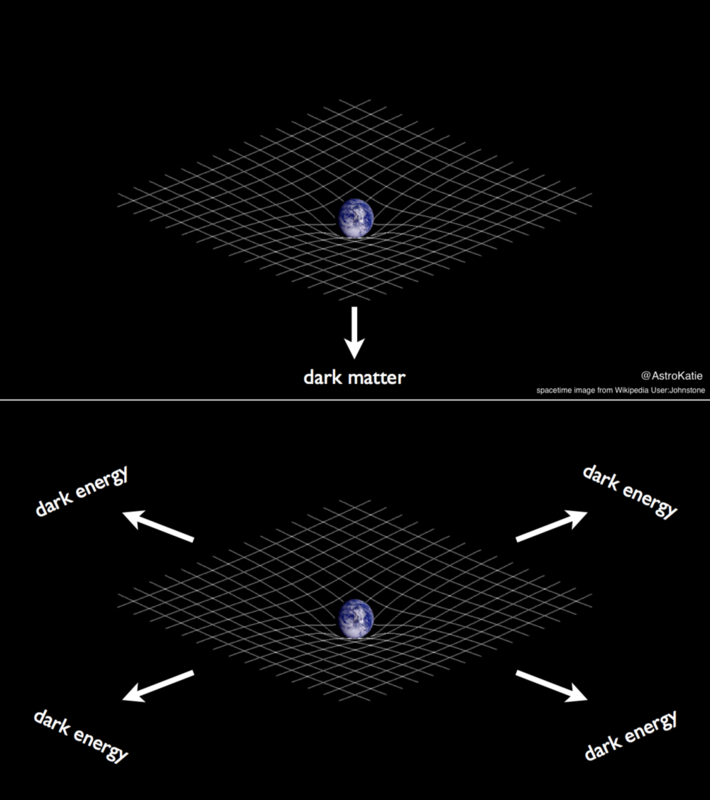 Dark energy, on the other hand, acts sort of counter to gravitational attraction, in the sense that it makes the Universe expand more quickly, and it seems to be uniform throughout cosmos. So probably they are only related in an accounting sense, in that they are two components of the Universe that we can't see and don't fully understand. Yet. Good question! I have no idea, but I would say probably yes, with some caveats. I think it is very unlikely that life has evolved in only one place in the entirety of the cosmos -- the sorts of physical processes that had to occur on the early Earth are probably things that have happened countless other times on distant worlds. We might even find life on other planets or moons in the Solar System. However, I also think it's very unlikely that alien life forms have come to Earth to visit us (and/or abduct people and/or build pyramids etc). For more on how people have tried to answer a variant of this question in the past, here's a link to a presentation I gave about the Drake Equation. Maybe! Check out my Media Enquiries page and feel free to e-mail me with details of what you need and what compensation you can offer. The limit here is almost always just time -- I have to balance my research work, my existing science outreach and communication efforts, and the ever-elusive concept of down time. As a working researcher I have a lot of demands on my time, including keeping up with all the professional research results in my field (see, e.g., this page for an idea of what that looks like). I just don't have time to read everyone's theories. But also, because the knowledge base in theoretical physics is so broad, and things progress so quickly, the idea that someone totally outside the field would come up with a major breakthrough sounds pretty far-fetched. There's a lot that goes into becoming a professional researcher, and a lot of that is the sort of training that can tell you if an idea you have is worth pursuing or not. So if you have a deep and abiding interest in theoretical physics, I can only recommend pursuing formal higher education in the field. I realize there's a financial hurdle to that, but I don't see many other options that will get you where you want to be. However, check out this page by Professor Gerard 't Hooft for a list of online resources that might be useful to those for whom university study is impossible. You may also want to check out Dr Sabine Hossenfelder's physics consultancy service which offers specialized physics feedback at reasonable rates. In any case, if you really think your idea is amazing and revolutionary, just e-mailing (or tweeting or snail-mailing) it to active researchers is not a particularly good way of getting it evaluated and discussed. You are much better off submitting it to a journal. (I am not a journal.) And just to be clear, I am also not available to endorse people I don't know and work with for arxiv submission. Highly unlikely. It's not you, it's that there are way too many of you. See my post here. Probably not, no. I keep my personal Facebook account limited to people I know in person, or, in some very special circumstances, people I interact with a lot online. However, you can "like" my public Facebook page and get (occasional) updates about science-related things.